For other uses of "station", see station (disambiguation). "Train depot" and "railway depot" redirect here. For other uses, see train depot (disambiguation). For the 2015 independent film, see Train Station (film). For the Ottawa rapid transit station formerly called Train station, see Tremblay station. "Gare" redirects here. For French train stations called "Gare" in English, see Gare (disambiguation). 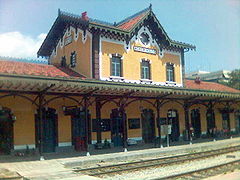 A train station, railway station, railroad station, or depot (see below) is a railway facility or area where trains regularly stop to load or unload passengers or freight. It generally consists of at least one track-side platform and a station building (depot) providing such ancillary services as ticket sales and waiting rooms. If a station is on a single-track line, it often has a passing loop to facilitate traffic movements. The smallest stations are most often referred to as "stops" or, in some parts of the world, as "halts" (flag stops). Glory of Commerce, a sculptural group featuring Hercules, Minerva, and Mercury, sits atop Grand Central Terminal in Midtown Manhattan, New York City, one of the ten busiest tourist attractions in the world. In the middle of the grouping is the 13-foot (4.0 m) clock, the world's largest example of Tiffany glass. 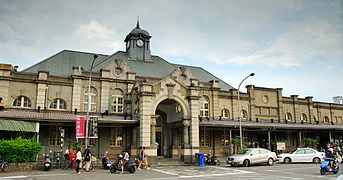 In North America, the term depot is sometimes used as an alternative name for station, along with the compound forms train depot, railway depot, and railroad depot, but also applicable for goods, and the term depot is not used in reference to vehicle maintenance facilities in American English. Baker Street station, London, opened in 1863, was the world's first station to be completely underground. Its original part, seen here, is just below the surface and was constructed by cut-and-cover tunnelling. Penn Station in Midtown Manhattan, New York City, is an important railway terminal and transfer hub as well as the busiest railroad station in the Western Hemisphere, serving more than 430,000 commuter rail and Amtrak passengers a day as of 2018. The world's first recorded railway station was The Mount on the Oystermouth Railway (later to be known as the Swansea and Mumbles) in Swansea, Wales, which began passenger service in 1807, although the trains were horsedrawn rather than by locomotives. The two-storey Mount Clare station in Baltimore, Maryland, which survives as a museum, first saw passenger service as the terminus of the horse-drawn Baltimore and Ohio Railroad on 22 May 1830. The oldest terminal station in the world was Crown Street railway station in Liverpool, built in 1830, on the locomotive hauled Liverpool to Manchester line. As the first train on the Liverpool-Manchester line left Liverpool, the station is slightly older than the Manchester terminal at Liverpool Road. The station was the first to incorporate a train shed. The station was demolished in 1836 as the Liverpool terminal station moved to Lime Street railway station. Crown Street station was converted to a goods station terminal. The first stations had little in the way of buildings or amenities. The first stations in the modern sense were on the Liverpool and Manchester Railway, opened in 1830. Manchester's Liverpool Road Station, the second oldest terminal station in the world, is preserved as part of the Museum of Science and Industry in Manchester. It resembles a row of Georgian houses. Dual-purpose stations can sometimes still be found today, though in many cases goods facilities are restricted to major stations. In rural and remote communities across Canada and the United States, passengers wanting to board the train had to flag the train down in order for it to stop. Such stations were known as "flag stops" or "flag stations". Stations built more recently often have a similar feel to airports, with a simple, abstract style. Examples of modern stations include those on newer high-speed rail networks, such as the Shinkansen in Japan, THSR in Taiwan, TGV lines in France and ICE lines in Germany. Stations usually have staffed ticket sales offices, automated ticket machines, or both, although on some lines tickets are sold on board the trains. Many stations include a shop or convenience store. Larger stations usually have fast-food or restaurant facilities. In some countries, stations may also have a bar or pub. Other station facilities may include: toilets, left-luggage, lost-and-found, departures and arrivals boards, luggage carts, waiting rooms, taxi ranks, bus bays and even car parks. Larger or manned stations tend to have a greater range of facilities including also a station security office. These are usually open for travellers when there is sufficient traffic over a long enough period of time to warrant the cost. In large cities this may mean facilities available around the clock. A basic station might only have platforms, though it may still be distinguished from a halt, a stopping or halting place that may not even have platforms. In many African, South American countries, and Asian countries, stations are also used as a place for public markets and other informal businesses. This is especially true on tourist routes or stations near tourist destinations. In addition to the basic configuration of a station, various features set certain types of station apart. The first is the level of the tracks. Stations are often sited where a road crosses the railway: unless the crossing is a level crossing, the road and railway will be at different levels. The platforms will often be raised or lowered relative to the station entrance: the station buildings may be on either level, or both. The other arrangement, where the station entrance and platforms are on the same level, is also common, but is perhaps rarer in urban areas, except when the station is a terminus. Elevated stations are more common, not including metro stations. Stations located at level crossings can be problematic if the train blocks the roadway while it stops, causing road traffic to wait for an extended period of time. Occasionally, a station serves two or more railway lines at differing levels. This may be due to the station's position at a point where two lines cross (example: Berlin Hauptbahnhof), or may be to provide separate station capacity for two types of service, such as intercity and suburban (examples: Paris-Gare de Lyon and Philadelphia's 30th Street Station), or for two different destinations. Stations may also be classified according to the layout of the platforms. Apart from single-track lines, the most basic arrangement is a pair of tracks for the two directions; there is then a basic choice of an island platform between, or two separate platforms outside, the tracks. With more tracks, the possibilities expand. Some stations have unusual platform layouts due to space constraints of the station location, or the alignment of the tracks. Examples include staggered platforms, such as at Tutbury and Hatton railway station on the Crewe–Derby line, and curved platforms, such as Cheadle Hulme railway station on the Macclesfield to Manchester Line. Triangular stations also exist where two lines form a three-way junction and platforms are built on all three sides, for example Shipley and Earlestown stations. In a station, there are different types of tracks to serve different purposes. A station may also have a passing loop with a loop line that comes off the straight main line and merge back to the main line on the other end by railroad switches to allow trains to pass. There may be other sidings at the station which are lower speed tracks for other purposes. A maintenance track or a maintenance siding, usually connected to a passing track, is used for parking maintenance equipment, trains not in service, autoracks or sleepers. A refuge track is a dead-end siding that is connected to a station track as a temporary storage of a disabled train. Opened in 1830 and reached through a tunnel, Liverpool's Crown Street railway station was the first ever railway terminus. The station was demolished after only six years, being replaced by Lime Street station in the city centre. The tunnel still exists. Opened in 1830, Liverpool Road station in Manchester is the oldest surviving railway terminus building in the world. Opened in 1836, Spa Road railway station in London was the city's first terminus and also the world's first elevated station and terminus. Sometimes, however, the track continues for a short distance beyond the station, and terminating trains continue forwards after depositing their passengers, before either proceeding to sidings or reversing to the station to pick up departing passengers. Bondi Junction and Kristiansand Station, Norway are like this. Some termini have a newer set of through platforms underneath (or above, or alongside) the terminal platforms on the main level. They are used by a cross-city extension of the main line, often for commuter trains, while the terminal platforms may serve long-distance services. Examples of underground through lines include the Thameslink platforms at Blackfriars in London, the Argyle and North Clyde lines of Glasgow's suburban rail network, in Antwerp in Belgium, the RER at the Gare du Nord in Paris, and many of the numerous S-Bahn lines at terminal stations in Germany, Austria and Switzerland, such as at Zürich Hauptbahnhof. An American example of a terminal with this feature is Union Station in Washington, DC, where there are bay platforms on the main concourse level to serve terminating trains and standard island platforms one level below to serve trains continuing southwards. The lower tracks run in a tunnel beneath the concourse and emerge a few blocks away to cross the Potomac River into Virginia. Terminus stations in large cities are by far the biggest stations, with the largest being the Grand Central Terminal in New York City, United States. Often major cities, such as London, Boston, Paris, Istanbul, Tokyo and Milan have more than one terminus, rather than routes straight through the city. Train journeys through such cities often require alternative transport (metro, bus, taxi or ferry) from one terminus to the other. For instance in Istanbul transfers from the Sirkeci Terminal (the European terminus) and the Haydarpaşa Terminal (the Asian terminus) traditionally required crossing the Bosphorus via alternative means, before the Marmaray railway tunnel linking Europe and Asia was completed. Some cities, including New York, have both termini and through lines. Terminals that have competing rail lines using the station frequently set up a jointly owned terminal railroad to own and operate the station and its associated tracks and switching operations. During a journey, the term station stop may be used in announcements, to differentiate a halt during which passengers may alight for another reason, such as a locomotive change. A railway stop is a spot along a railway line, usually between stations or at a seldom-used station, where passengers can board and exit the train. A halt, in railway parlance in the Commonwealth of Nations and Republic of Ireland, is a small station, usually unstaffed or with very few staff, and with few or no facilities. In some cases, trains stop only on request, when passengers on the platform indicate that they wish to board, or passengers on the train inform the crew that they wish to alight. In the United Kingdom, most former halts on the national railway networks have had the word halt removed from their names. Historically, in many instances the spelling "halte" was used, before the spelling "halt" became commonplace. There are only two publicly advertised and publicly accessible National Rail stations with the word "halt" remaining: Coombe Junction Halt and St Keyne Wishing Well Halt. In addition there are a number of other such stops in the UK rail network such as Penmaenmawr in North Wales, where passengers are requested to inform a member of on-board train staff if they wish to alight, or, if catching a train from the station, to make themselves clearly visible to the driver and use a hand signal as the train approaches. A number of other halts are still open and operational on privately owned, heritage, and preserved railways throughout the British Isles. 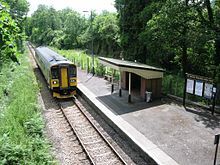 The word is often used informally to describe national rail network stations with limited service and low usage, such as the Oxfordshire Halts on the Cotswold Line. The title halt had also sometimes been applied colloquially to stations served by public services but not available for use by the general public, being accessible only by persons travelling to/from an associated factory (for example IBM near Greenock – although this is no longer restricted – and British Steel Redcar), military base (such as Lympstone Commando) or railway yard. The only two such remaining "private" stopping places on the national system where the "halt" designation is still officially used seem to be Staff Halt (at Durnsford Road, Wimbledon) and Battersea Pier Sidings Staff Halt – both are solely for railway staff and are not open to passengers. The Great Western Railway in Great Britain began opening haltes on 12 October 1903; from 1905, the French spelling was Anglicised to "halt". These GWR halts had the most basic facilities, with platforms long enough for just one or two carriages; some had no raised platform at all, necessitating the provision of steps on the carriages. Halts were normally unstaffed, tickets being sold on the train. On 1 September 1904, a larger version, known on the GWR as a "platform" instead of a "halt", was introduced; these had longer platforms, and were usually staffed by a senior grade porter, who sold tickets, and sometimes booked parcels or milk consignments. From 1903 to 1947 the GWR built 379 halts and inherited a further 40 from other companies at the Grouping of 1923. Peak building periods were before the First World War (145 built) and 1928–39 (198 built)). Ten more were opened by BR on ex-GWR lines. The GWR also built 34 "platforms". In many Commonwealth countries the term "halt" is still used. In the United States such stations are traditionally referred to as flag stops. In Germany, the term is Haltepunkt (Hp). In the Republic of Ireland, a few small railway stations are designated as "halts" (Irish: stadanna, sing. stad). In Victoria, Australia, a rail motor stopping place (RMSP) is a location on a railway line where a small passenger vehicle or railmotor can stop to allow passengers to alight. It is often designated by just a sign beside the railway at a convenient access point near a road. The passenger can hail the train driver to stop, and buy a ticket from the guard or the conductor on the train. 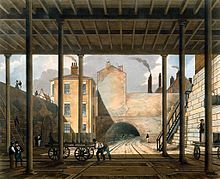 Reached by a 1.24-mile (2 km) long tunnel, the 1830 Park Lane Goods Terminus at Liverpool's docks was the world's first station built entirely for freight. Goods or freight stations deal exclusively or predominantly with the loading and unloading of goods and may well have marshalling yards (classification yards) for the sorting of wagons. The world's first goods terminal was the 1830 Park Lane Goods Station at the South End Liverpool Docks. 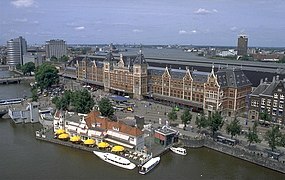 Built in 1830, the terminal was reached by a 1.24-mile (2 km) tunnel. Grand Central Terminal in New York City is the largest station by number of platforms, with 44 on two levels. Clapham Junction in London is the busiest station in terms of rail traffic with an average of one train every 20 seconds at peak times. The world's busiest passenger station, in terms of daily passenger throughput, is Shinjuku Station in Tokyo. In terms of platform capacity, the world's largest station by platforms is Grand Central Terminal in New York City with 44 platforms. The world's highest station above ground level (not above sea level) is Smith–Ninth Streets subway station in New York City. Coney Island – Stillwell Avenue in New York City is the world's largest elevated terminal with 8 tracks and 4 island platforms. The Shanghai South Railway Station, opened in June 2006, has the world's largest circular transparent roof. Gare du Nord, in Paris, is by the number of travellers, at around 214 millions per year, the busiest railway station in Europe, the 24th busiest in the world and the busiest outside Japan. Zürich HB is the busiest terminus in Europe by the volume of rail traffic. 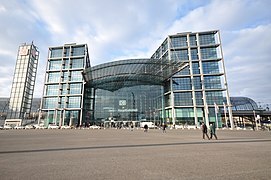 Leipzig Hbf is the biggest railway station in Europe in terms of floor area (83,460 square metres (898,400 sq ft)). München Hbf is the largest railway station by number of platforms (32). Jungfraujoch railway station is the highest railway station in the European continent (3,453 metres (11,329 ft)). Penn Station in New York City is the busiest station in North America. Toronto's Union Station is the busiest station in Canada. Antwerpen-Centraal station in Antwerp, Belgium, nicknamed the "Railway Cathedral"
Atocha Station, in the city of Madrid, is the biggest train station in Spain. Budapest Keleti railway station in Budapest, Hungary. Luz Station in São Paulo, Brazil. Since 2006, is also the seat of Museum of the Portuguese Language. 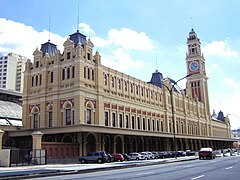 Dunedin Railway Station, in Dunedin, New Zealand, is one of the country's most famous historic buildings. Railway station in Bereket city, Turkmenistan. Coleford, I. C. (October 2010). Smith, Martin (ed.). 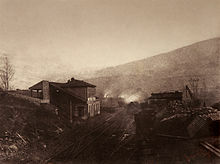 "By GWR to Blaenau Ffestiniog (Part One)". Railway Bylines. Radstock: Irwell Press Limited. 15 (11). ^ Ian Jolly (1 August 2014). "Steamed up about train stations". Academy (blog). London: BBC. Retrieved 28 August 2015. ^ Morana Lukač (12 November 2014). "Railway station or train station?". Bridging the Unbridgeable. A project on English usage guides (blog). Leiden, The Netherlands: Leiden University Centre for Linguistics. Retrieved 28 August 2015. ^ "Google Books Ngram Viewer. British English Corpus". Retrieved 28 August 2015. ^ "Google Books Ngram Viewer. American English Corpus". Retrieved 28 August 2015. ^ "Definition of depot by Merriam-Webster". merriam-webster.com. Retrieved 13 July 2017. ^ "The 51 busiest train stations in the world– All but 6 located in Japan". Japan Today. 6 February 2013. Retrieved 26 November 2018. ^ "SNCF Open Data — Fréquentation en gares en 2016". Paris, France: SNCF. Retrieved 19 March 2018 – via ressources.data.sncf.com – SNCF OPEN DATA. ^ a b c d e f g Oishimaya Sen Nag (23 October 2017). "Europe's Record-Holding Railway Stations". WorldAtlas.com. Quebec, Canada. Retrieved 15 September 2018. ^ Devin Leonard (10 January 2018). "The Most Awful Transit Center in America Could Get Unimaginably Worse". Bloomberg L.P. Retrieved 14 November 2018. ^ "Mumbles Railway". bbc.co.uk. 25 March 2007. Retrieved 1 May 2015. ^ "B & O Transportation Museum & Mount Clare Station". National Historic Landmarks in Maryland. Maryland Historical Trust. Retrieved 9 February 2014. ^ Moss, John (5 March 2007). "Manchester Railway Stations". Manchester UK. Papillon. Retrieved 13 March 2008. 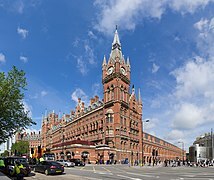 ^ "The Inception of the English Railway Station". Architectural History. SAHGB Publications Limited. 4: 63–76. 1961. doi:10.2307/1568245. JSTOR 1568245. ^ "Stations of the Gatineau Railway". Historical Society of the Gatineau. Archived from the original on 16 December 2005. Retrieved 11 May 2006. ^ Miserez, Marc-André (2 June 2004). "Stations were gateways to the world". SwissInfo. Retrieved 13 March 2008. ^ "Italian Railroad Stations". History of Railroad Stations. Retrieved 13 March 2008. ^ a b c "Technical Memorandum: Typical Cross Section for 15% Design (TM 1.1.21)" (PDF). California High-Speed Rail Program. Retrieved 18 March 2014. ^ "National Rail Enquiries". Retrieved 30 July 2018. ^ MacDermot, E.T. (1931). "Chapter XI: The Great Awakening". History of the Great Western Railway. Vol. II (1st ed.). Paddington: Great Western Railway. p. 428. ISBN 978-0-7110-0411-5. ^ Booker, Frank (1985) . The Great Western Railway: A New History (2nd ed.). Newton Abbot: David & Charles. pp. 112–113. ISBN 978-0-946537-16-7. ^ Coleford 2010, p. 509. ^ a b "Machines & Engineering: Building the Biggest". Discovery Channel. 2008. Retrieved 13 March 2008. ^ "The railway station with world's largest transparent roof". People's Daily. Beijing. 26 June 2006. Retrieved 13 March 2008. ^ "State begins public review for new Moynihan Station" (Press release). Empire State Development. 23 October 2007. Archived from the original on 7 February 2008. Retrieved 12 February 2008.